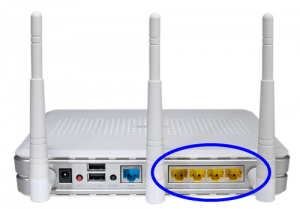 On some routers like the Rt-N16 and builds of DD-WRT you have the option of segregating one or even all of the LAN ports on the back of the router and keeping the LAN traffic separate on each individual port. This is done through DD-WRT’s use of VLANs (Virtual Local Area Network). Why would you want to do this? I’ll answer that question with the scenario below. Let’s say I’m installing an RT-N16 for a Client’s Building. There are ten computers and one file Server that are all on the “Company A” network. Computers on the “Company A” network access the Internet and shared files on the Server. However, one of the offices in the Client’s Building is subleased to another company, “Company B”. “Company B” needs Internet Access and possibly access to their own file Server in that same office. Most importantly though, “Company B” should not have access to the ten computers or the Server on the “Company A” network and vice verse, “Company A” should not have access to any network resources on the “Company B” network. While their are several ways I can accomplish this I will describe how to set up VLANs through DD-WRT on an Asus RT-N16 below. note: on my step-by-step how to I actually seperate all the LAN ports, not just two of the ports as described above. – The physical Port 1 on the back of router called LAN1 will broadcast an IP address on the 192.168.1.X subnet. – Physical Port 2 (LAN2) will broadcast an IP address on the 192.168.2.X subnet. – Physical Port 3 (LAN3) will broadcast an IP address on the 192.168.3.X subnet. – Physical Port 4 (LAN4) will broadcast an IP address on the 192.168.4.X subnet. – Everyone should be able to get out to the Internet. 1. First and Foremost. I have only tested these instructions on the following build’s of DD-WRT. Others could work but your mileage may vary. 2. Freshly install one of the builds above and reset to factory defaults. (What? You don’t know how to install one of those build’s on your RT-N16? Head over here, then head on back to start setting up your VLANs.) I have found the easiest way to do this is to log in to the router via telnet command and type in “erase nvram”. Hit the Enter key and then type in “reboot”. The Factory defaults will be restored. After you have reset everything wait a couple of minutes before you proceed. 3. Plug your computer into LAN1 on the back of the router. 4. Open a browser (IE or Firefox, not sure about Chrome) and go to 192.168.1.1. 5. Change the username and password when prompted. I used the typical username “root” and password “admin”. 6. Once you changed the username and password and you know they work Close Internet Explorer. 7. Open a Command prompt and Telnet into the router 192.168.1.1, log in, and then input these commands below. After each line, hit the Enter key. 8. Gonna have to wait a few minutes for it to reboot. Get a cup of coffee or something. 9. Login into web interface 192.168.1.1 and then go to Setup–>Vlans. Uncheck Port 1 and put a checkmark for VLAN 4 for Port 1. Uncheck Port 2 and put a checkmark for VLAN 3 for Port 2. Uncheck Port 3 and put a checkmark for VLAN5 for Port 3. 11. Go to the Administration tab and then click Reboot Router. You must do this to get the Vlan 2, 3 and 4 options to show up in the next steps. 12. Yep, you’re waiting a few minutes for it to reboot again. Just think about how happy you’ll be when this works. But make sure to think for a couple minutes. 13. Log back in to the router and go to Setup–>Networking. 15. After all the above have been entered click on Save. 16. You should still be in the Setup–>Networking Page. Go to the bottom and for the section on DHCPD click on Add under Multiple DHCP Server. 17. Click on the Dropdown where it currently says eth0 and choose vlan3. Then click on Save. 18. Again, click on the Add button in the DHCP section like you just did. This time we want to change the DHCP 1 entry to vlan 4. Then click on Save. 19. One more time, click on the Add button and change it to vlan5. Then click on Save. 20. Now click on Apply Settings. 21. Go to the Administration tab and then click Reboot Router. 22. This should be the last time you have to wait. So get ready for some ultimate VLAN’ing fun. Oh Yeah! – Plugging into LAN4 (Actual port on the router itself) should give you a 192.168.4.X address. – Plugging into LAN3 should give you a 192.168.3.X address. – Plugging into LAN2 should give you a 192.168.2.X address. – Plugging into LAN1 give you 192.168.1.X addresses. – Any port should be able to get out to the Internet. 24. Now, You’ve got some VLANs but everyone can talk to everyone else. You need to setup firewall scripts to prevent that. Continue on to the Firewall Scripts below. I had a lot of trouble getting my Firewall Scripts working. Initially, what I found on the web for setting the Asus RT-N16 did not work. I found that every page that referenced the VLAN firewall scripts appeared to be with the use of the command INPUT versus the command FORWARD. Once I got this correct the following results should occur when following the instructions below. – Clients on VLAN3 (192.168.3.1), VLAN4 (192.168.4.1), and VLAN5 (192.168.2.1) will not be able to Access the router’s IP at 192.168.1.1 via telnet, web, etc. They will be able to ping the IP. – Each VLAN cannot access each other or the clients that are connected through a different VLAN. For example, Clients on VLAN3 cannot access anything but other clients on VLAN3 and the Internet. – If a client tries to ping anyone on a different VLAN there is no response. 1. Plug your computer in LAN1 on the back of the router. 2. Open a browser (IE or Firefox, not sure about Chrome) and go to 192.168.1.1. 4. Input the commands below into the Command window. You should be able to copy and paste. 5. Click on Save Firewall. 7. Click on Reboot Router. You should now have an Asus RT-N16 with Firewall scripts to prevent VLANs from accessing other VLANs. Last thing I’d do if I were you is TEST! TEST! TEST! Make sure things work the way you think they should.